Our Raynor Massage Diploma course combines with our 5 day Raynor Massage Certificate Course. Brandon Raynor’s Massage Diploma Course will teach you techniques and benefits of massage, how to work with the body’s chi, practical hands-on massage therapy from the patient and the therapist’s perspectives, acupressure massage, aromatherapy massage, and qualities that make a good massage therapist.Many of our students feel that this course is the most important stepping stone in their massage career. Enjoy our classes at a fraction of the massage class hours and massage tuition fee of other massage therapy schools. This programme is designed for those wanting to enter the massage profession or who want to develop their massage skills further. Even if you have extensive massage experience in a different modality you first need to study at Certificate level before you can study for our Diploma course. You can study it in combination with the Certificate course as detailed here and it is also possible to study the second Diploma week at a different time or in a different location from your Certificate. Many of our students do the two courses together as a 10 day combined Certificate and Diploma course, but it is designed to be flexible to fit around your existing commitments and budget. On completion of the Diploma course, and ideally having gained experience with using the massage professionally, students are then eligible to join our highest level course, the Advanced Practitioners Course. You can only take the Advanced Practitioner’s course if you already have a Raynor Diploma, regardless of your other qualifications and experience in other massage modalities. Under the expert teaching of one of our teachers and studying in a group of no more than 16 people to one teacher, we expect that everyone completing the course will be a very good massage practitioner by the time they qualify. Because Raynor Massage is such a unique massage style you can become incredibly effective with just two weeks of training and be able to integrate both reflexology and aromatherapy into your massage practice. Our Massage Diploma course is designed for people who would like to start a new career in the massage industry or for existing health professionals that would like to expand their skill range to include the wide variety of techniques and philosophy that make up Raynor massage. As with the Certificate course this unique form of massage is taught in a very hands-on way. The tutor input, hands on giving massage and receiving massaged applies for the Diploma course as it does for the Certificate, this is because you will learn so much from both giving and receiving the massage. You will work with different people across the week so that you can gain experience working with different body types while learning how different people hold their tension. You will gain more experience in learning to adapt the depth of the massage so that it is appropriate for the individual client. On the final day of the course we open the doors for our ‘student clinic’ where we invite members of the public to receive a free massage. This is an integral part of the assessment of the Diploma where you will carry out everything learnt on the course, from taking a case history, selecting oils, giving a full body treatment and discussing aftercare advice with your client. The aim of the massage remains the same for the Diploma as for the Certificate, you are learning to find tension in the body and how to eliminate it. On the Diploma course this tension release is taken to a deeper level and it is often possible to access tension that has been stored for many years, even since childhood. The Diploma trains the massage therapist to work in greater depth, to track and to release the bands of tension that run through the body. 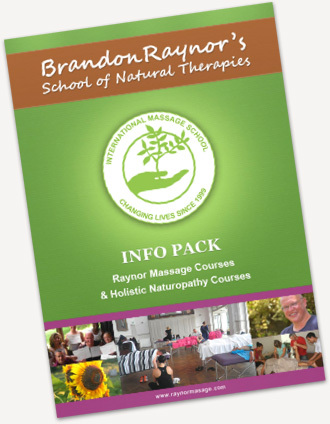 This Diploma in Raynor Massage Therapy is designed by Brandon Raynor and is only available through the Brandon Raynor School of Natural Therapies. It is run in locations throughout the world. All teachers are Advanced Practitioners in Raynor Massage who have been trained by and have worked with Brandon and whom he has personally approved. All teachers are also practitioners and they also work with Brandon on a regular basis for their own development. Big thanks to Terry Masson! His teachings were very efficient and compassionate. It’s amazing how much I learned within these two weeks and I’m already having exceptional results with the massage treatments I gave so far. The Raynor Technique is more than only massage, it works on all levels and is a truly holistic healing method. Brandon has spent over twenty years traveling around the world studying massage and continues to do so today. The Diploma course specifically draws on two additional disciplines from the worldwide understanding of massage in its focus on both reflexology and aromatherapy. Course days are very intensive and usually run from 9-5pm, Monday to Friday with a 45 min to 1 hour break for lunch each day. For details of Days 1 – 5 which comprises the Certificate course, please see the 5 day Raynor Massage Certificate Course. The second week of the Diploma course is as follows. Day 1 of the Massage Diploma will look in further detail at the full practitioner/client interaction including each student taking a case history and giving a full massage to suit the client’s needs within a specified length of time. During this treatment the teacher will carry out a formative assessment and give feedback to the student to highlight areas that each individual needs to develop further. This will give the student a focus for the areas that they will need to work on during the next 4 days of the course. On day 2, the teacher will introduce the use of aromatherapy oils to the massage treatment. He/she will cover the properties and use of some of the most commonly used aromatherapy oils. You will be taught how to diagnose which oils are suitable for particular clients and learn the contraindications of each oil. You will learn how to blend oils to their correct ratio so that they are effective in supporting the healing process. You will then experiment with their use during practice with both deep tissue massage and also lighter massage, mixing oils to suit the needs – and nose – of your massage partners. Day 3 of the diploma course will usually be the reflexology course day. We will learn the reflexology areas of the feet and the hands. You will explore the importance of the feet and hands in massage and how they affect and benefit the whole treatment. The zone theory of reflexology and the use of reflexology charts will also be discussed. You will then both carry out and experience this powerful and relaxing reflexology massage. Day 4 of the course will concentrate on the specific aspects of face and scalp massage and the use of acupressure points in the head to help alleviate stress, tension, headaches, neck problems. We will explore the relationship between releasing tension in the head and jaw and the effect this has in helping release the emotional tension stored in the belly and chest. This incredibly relaxing day of massage inevitably results in a good night sleep. The final day of the Massage Diploma course will involve any final revision necessary, as well as a detailed tutor assessment which will grade each student on the following qualities: empathy, communication, techniques, professionalism, correct pressure, and overall effect. The last day of the massage course will see us invite members of the public to the class to receive a massage. Your assessment will be based on you understanding of the role of the patient in the three categories of communication, understanding the importance of breathing with a practitioner, and on your proper understanding and appreciation of the benefits of massage. At the close of this day, having passed your assessment, you will be awarded the Diploma in Raynor Massage Therapy. We do not have any written exams or assessments to be submitted, rather your teacher will continually assess you through the course, giving formative feedback to allow you to correct and develop your massage. You will massage your teacher and members of the public and we believe this is a far more effective test of abilities as a massage practitioner than testing you on your memory of Latin names for the parts of the body! We do not separately assess your knowledge of health and safety, hygiene or draping because all of these skills are integral to you being a good massage practitioner so these elements are embedded into the ongoing daily assessment and feedback throughout the entire course. It was an AMAZING experience for me to do the certificate and Diploma course. I must say, what a privilege to have Brandon as our Instructor. Your style of teaching and approach is very holistic. It’s very practical from the very first day. I’ve learned so much for first day of the course that I was really excited to practice the massage in the weekend. Brandon I salute you, you rock!!! I would really recommend this kind of training. I’m really looking forward to do the advance diploma in the future. Brandon you are a blessing to all of us in the course. For Australia: AU$2,995 (AU$995 deposit). You can also gain further discounts by booking our Advanced Diploma course at the same time. Have a look at the details of the Advanced Diploma for further details of these savings. We cap the number of students at 20 per teacher in order to ensure a focused learning experience. This means that demand for course places can be high. We always recommend early booking to secure your place. Deposits are non-refundable, if you need to cancel please give us a month’s notice and we will transfer your deposit to another course. We will always aim to be flexible should an emergency occur and you cannot attend at short notice. For the 10 day Combined Certificate Diploma course we do not have any set entry requirements other than being over the age of 16 and having a desire to learn and to heal through massage. For more information please contact us. However if you wish to strictly do the second half of the Diploma course you must have first studied the Certificate Course in Raynor Massage at some point. The pace and teaching on the course assumes Raynor Massage Certificate level prior knowledge. We partner with Health Schools Australia for those students who want to go on gain their Cert IV qualification. Details are published on the relevant course location pages.